Take it easy in a Napa Valley town where relaxation trumps everything else, including wine. 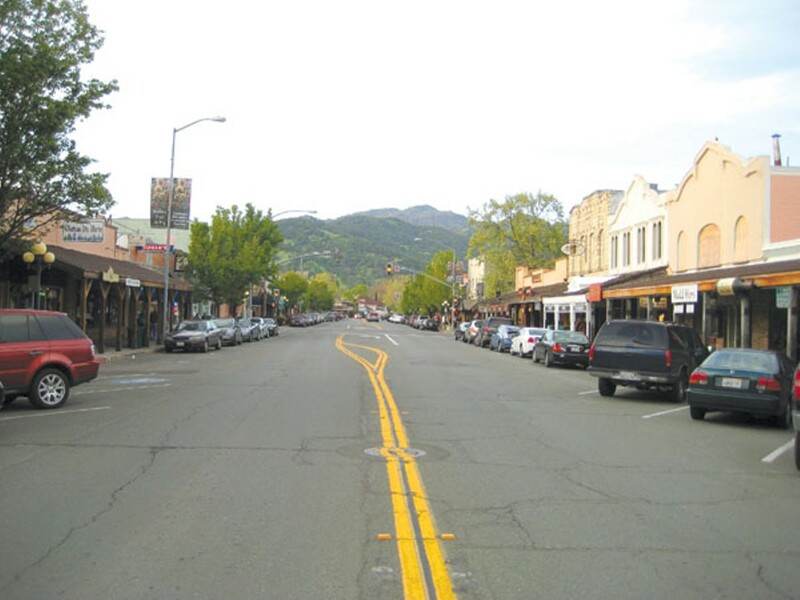 The pace of life in Calistoga is slow — and that is part of its charm. We had just left the tasting room of a small winery called Silver Rose on the edge of downtown Calistoga. After sampling two reds for $5, peering into a massive koi pond, and puzzling over a collection of a hundred football helmets hanging on the walls, my wife and I were ready to move on. But before we reached the car, a Honda Civic crept up conspicuously behind us. The driver's side window dropped. Inside, we recognized a stylishly dressed twentysomething couple from the tasting room just a few moments before. "You don't look like the sort of people who would," the young woman in big sunglasses began tentatively. "And it's okay if you don't. But do you want the rest of this?" The young man in the passenger seat leaned toward us, extending a smallish yet still-smoldering joint toward the window — unabashedly, as if we were sharing a blanket at a Phish show. The funny thing is we'd pegged them for the stuffy type after they told the pourer/owner that they hailed from 25 miles away in Napa. Now we knew the truth: Calistoga is where the wine country comes to chill out. That's why we'd come, too. Lured by hot springs, cool wineries, good food, and better weather, we'd escaped for the weekend to this laidback town of 5,200 nestled in the shadow of Mount St. Helena and its craggy foothills. Located at the northern end of Napa Valley, it's an ideal wine country destination for folks who aren't enamored with wine country. Marquee tasting rooms with capacious patios have their place, but not here; instead, you'll find some of the valley's smallest wineries, which possess in charm what they lack in panache. Or one could opt for a hike in nearby Robert Louis Stevenson State Park, a spin around town on one of the many cruisers bikes available for rent, or a spa day spent slouching from one indulgence to the next. You get the feeling none of the shorts-and-T-shirt-wearing locals would be offended if you skipped the wine thing altogether. 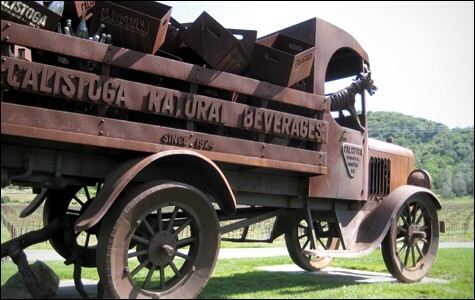 For our getaway, we decided to at least pay token visits to a few of Napa Valley's backroads wineries. Eight or so can be found within and around Calistoga. On the drive north, about ten minutes short of town (and eighty minutes from Oakland), we stopped at Madrigal Vineyards. After passing through commercial Napa and upscale, congested St. Helena, its pastoral ambience came as a relief. Officially, tastings here are by appointment only; lacking one, we rolled into the diminutive parking lot anyway, planning to try our luck. And, in our first taste of Calistoga's easygoing attitude, the friendly pourer helped us anyway — a party of eight was due in any minute, and he could serve us at the same time. Fifteen dollars was supposed to buy us five tastes, but again he went beyond and offered us tastes of two pricier bottles uncorked for the other group. Our next stop, east of downtown Calistoga, was the aforementioned Silver Rose. Its wines — including a unique 2004 Dentelle blend of Cabernet Sauvignon, Cabernet Franc, and Merlot — didn't suit our taste, but the grounds were impressive and the weather ideal for enjoying them. Finally, we cruised down the street to Lava Vine, which has no distribution beyond local restaurants, produces only 1,200 cases a year, and according to our pourer is the smallest of Napa Valley's 300 wineries. The accommodations were, again, resolutely laidback. We chatted with the pourer, fellow tasters, and even the three-person Bay Area television crew that arrived to film a short segment. Eventually we grabbed a seat on a couch directly across from the bar and sipped it all in. On our way out, we stopped by a pen a few hundred feet from the tasting room where the owners kept a mother goat and her newborn, Skittles, and said hello. Where were we? Back in town, no one seemed to have much to do. Fortunately, we didn't either. We grabbed sandwiches in a cafe near the town's 140-year-old train depot, now converted to shops; remarked on the proliferation of flip-flops; listened in on four girls' idle gossip. Checking in at our hotel, Calistoga Inn and Hot Springs, was a pleasant if underwhelming experience. Its buildings are white, spare, and institutional in appearance, designed for families and modest budgets. Our room was of a similar bent: resoundingly practical, with a stocked kitchenette, nice new windows for noise and weather insulation, and a Weber grill on the patio. Couples can forgive the lack of romance by appreciating the hotel's central location a block off the main drag and, as its primary appeal, four naturally heated mineral pools: a 104-degree spa, a 100-degree soaking pool, a 90-degree kids' pool, and an 80-degree lap pool. Lines for day use — that is, lounging lackadaisically for hours on end, perhaps capped with a massage or mud bath — snake outside the front door on a regular basis. Of course, the town is full of hot springs options, from modest to luxurious. If this place didn't suit your fancy, another would. 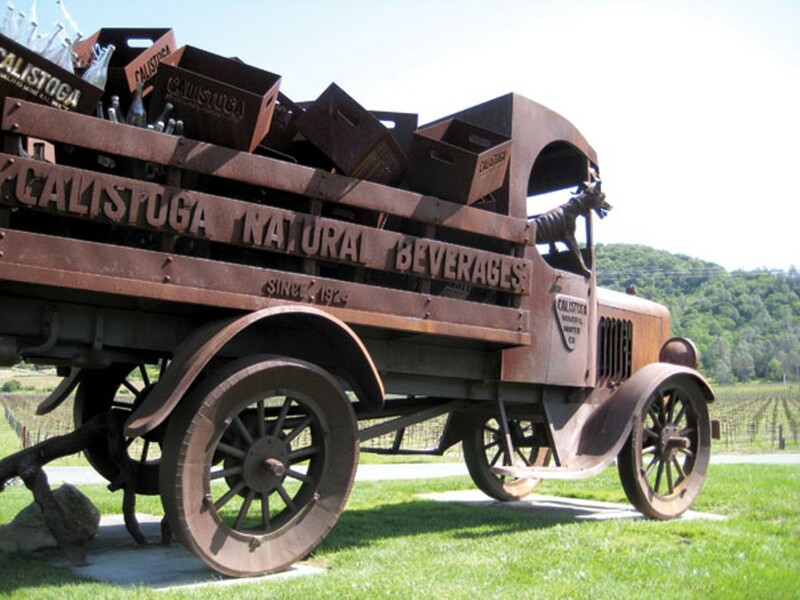 Around dinnertime on a weekend evening, Calistoga comes alive — relatively speaking. Couples stroll hand-in-hand along sidewalks, peering at menus in storefront windows and weighing their options and appetites. The whole exercise seems a pastime in itself. Yet there are few bad choices here, and while truly cheap meals are probably only found at the grocery store down the street, value is a ruling principle. The All Seasons Bistro, where we settled, served a gourmet appetizer of prosciutto and asparagus, top-rate plates, and half a bottle of possibly the best local wine we tasted all weekend for just over $35 per person. After dinner, the couples resume their sojourns toward one of a number of ice cream parlors and other shops. We did, too, then retired to our room. Through its dual-pane windows we heard an amplified mariachi band perform for a quinceañera at the same cafe where we'd grabbed lunch, up until 11:30 p.m. Noise ordinances are so uptight. The next morning, we headed out of town for a visit to Robert Louis Stevenson State Park. From downtown to the trailheads is thirty minutes, a winding, scenic drive through oak savannahs not unlike that up Mt. Diablo. Thanks to a rocky, uneven trail, our 4.4-mile hike was more than we bargained for in our relaxed state, but the path through a pine forest and a broad expanse of chaparral — the pink flowers of the manzanita and the white, fragrant California lilac in full bloom — was hard to complain about. And the view of sleepy Calistoga from Table Top Rock, a tall shelf on a tongue of lava flow extending south from Mount St. Helena's peak, was every last bit worth the effort. After all, a glass of wine and a hot soak were only a half-hour away. We tracked down amazing, lesser-known trucks in East and West Oakland for your summer eating. Take a little bit of home with you wherever you go with these seven new releases. Whether you're an athlete or non-swimmer, there's a pool for you. Our annual guide to Northern California's summer recreation season. For California to reach its ambitious climate-change goals, it must figure out how to deliver electricity when the sun isn't shining and the wind isn't blowing.